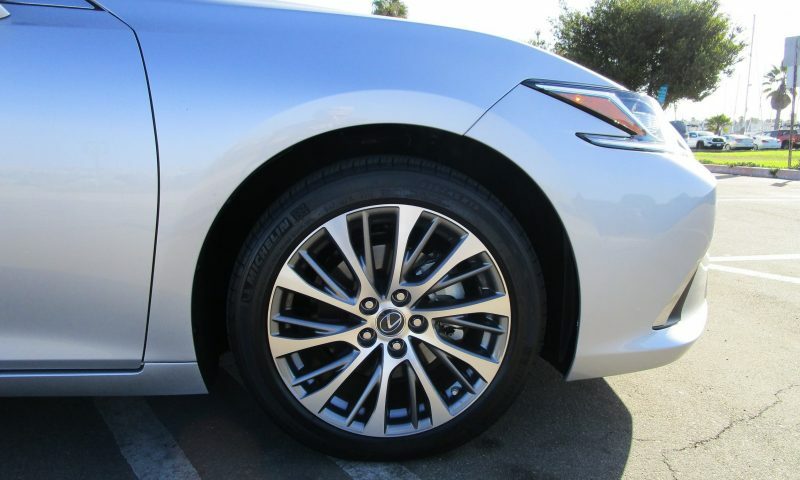 The Lexus ES has always been a nice car. 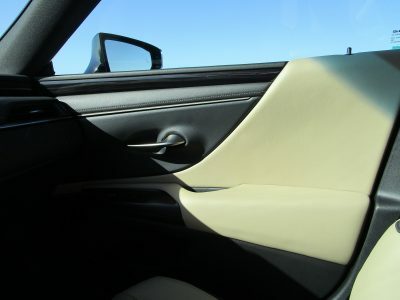 It was one of two models offered by Toyota’s luxury division when it launched in 1990. The LS400 was an all-new technological tour de force that took on Europe – and America’s – finest, and showed that the Japanese could compete and win on the world stage. And then there was the ES. 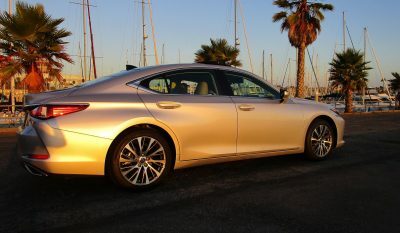 Basically, a Camry with sporty C-pillar that was sold in other markets, Lexus put a heavy ladle of luxury on it, but compared to the LS, it was kind of lukewarm. In many ways, that has remained the ES’ mission in life, nice, luxurious, but the least pulse-raising of the family. It’s been the entry point for the brand for a long time. 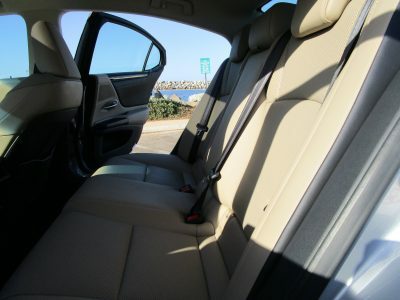 And when the lower-priced IS models came in, all sporty and youth-oriented, the ES soldiered on as it was. Well for 2019, we have an all-new ES350, and thanks to sharing the underpinnings with the all-new Camry and Avalon – both dynamite and surprisingly fun cars to drive – is it the time for the ES to light our fire? Well, it looks more exciting. 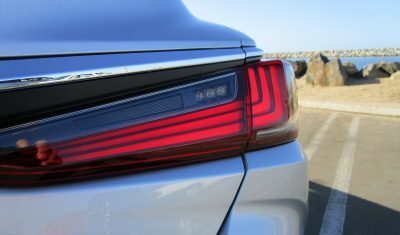 It’s clear if you squint that some of the Camry styling cues live on here – but that’s no bad thing, we love the Toy’s new looks. 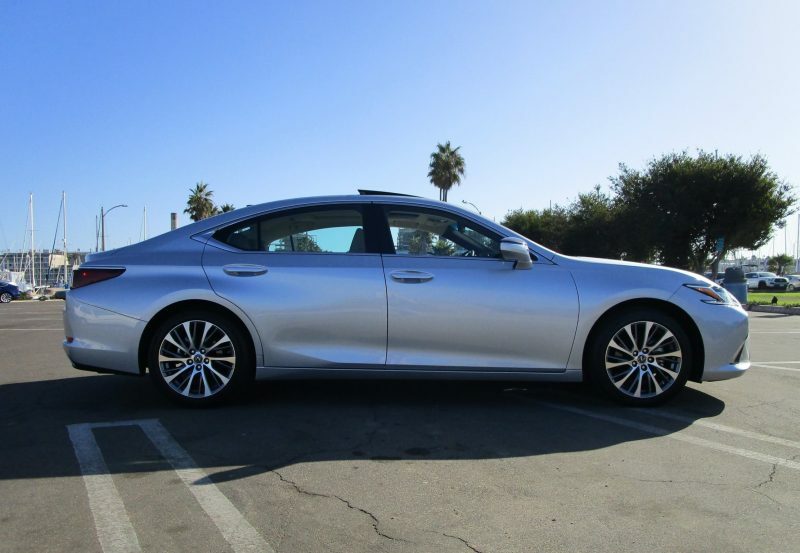 Longer, lower and wider, it sits with some attitude, while still imparting the luxury vibe. 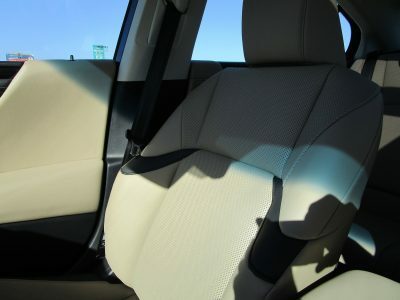 Project Chief Designer, Yasuo Kajino, describes the look of the ES as “provocative elegance”. We’ll go for that. 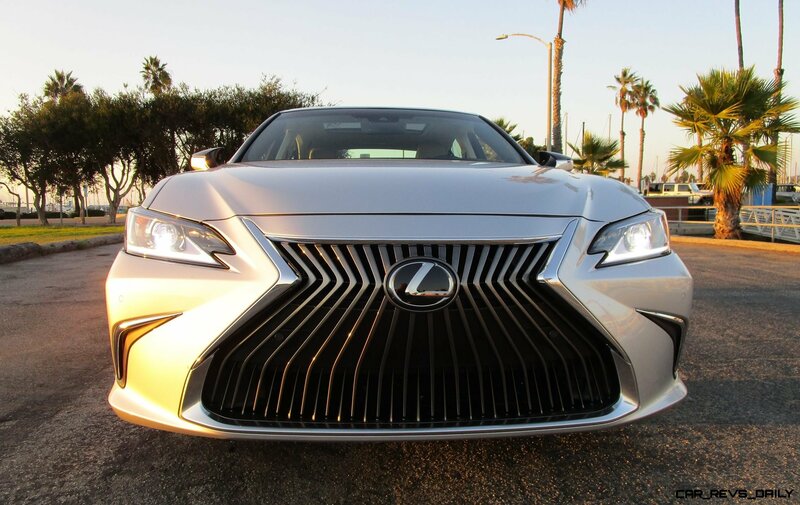 Certainly, one of the most provocative features is the oversize Lexus spindle grille. 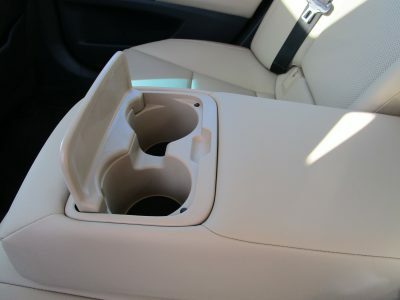 Maybe we’re getting used to it, or it fits well into the design, but it serves as a clear notice that this is a Lexus. 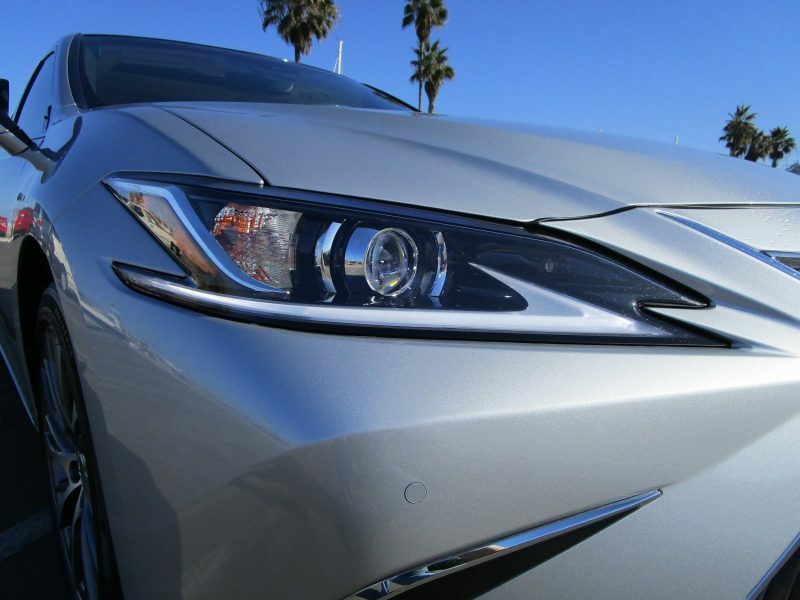 Helping sell the story are slim LED headlamps with L-shaped marker lights. 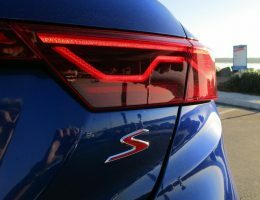 The rear LED lamps are especially appealing, with a unique 3D design that gives a crisp, modern look. 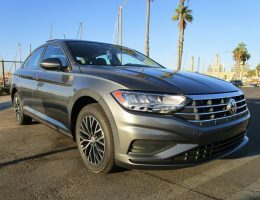 Sitting on optional 18” machine-finished rims, tastefully dressed in Atomic Silver, our tester looked elegant and purposeful. 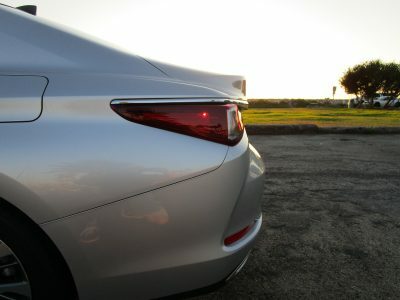 But tugging at our heart-strings, there will also be a new F-Sport model. 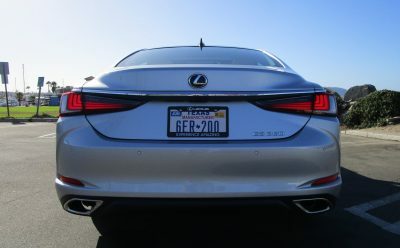 The first ES F-Sport ever, it gets meaty 19” rims similar to the big-boy LC and LS, trunk lid spoiler and dark exterior accents. It’s just enough to take the tasty design to spicy. We look forward to the chance to kick it up a notch. Stepping inside, the ES is familiar – especially if you’ve spent any time in the new LS or LC. 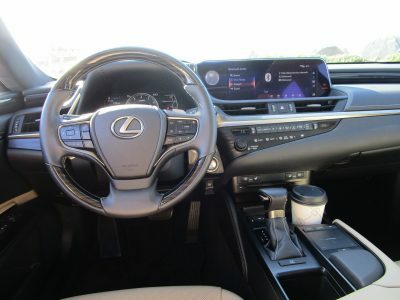 While Lexus calls the concept “Seat in Control”, it really just means driver-focused – a change of style for the ES, which always seemed more interested in impressing your passengers. You get the good feelings right away. 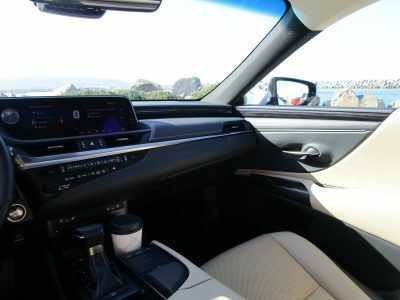 This interior feels special and upscale, the materials are top-drawer – hey, it’s a Lexus – and the overall design feels much more European than before. 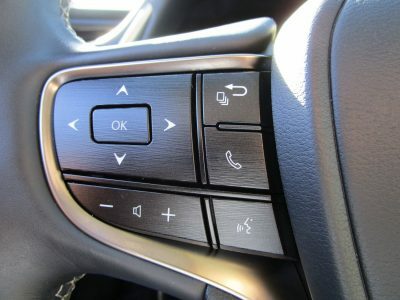 Here, like the LS and LC, there is an LCD instrument panel that features a large analog-style tach, digital speedo, and multi-information meter. 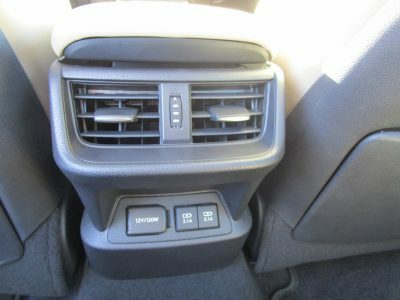 It’s a cozy display and the “ears” on either side of the dash give you rotary switches for the driver’s mode and traction control. 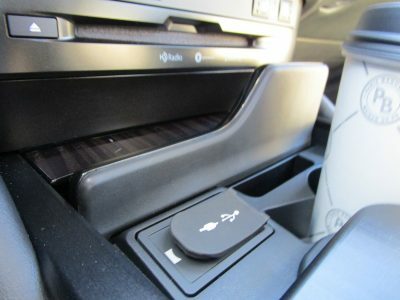 While the instrument display is tight and concise, the info-tainment display is a massive 12.3-inch affair. 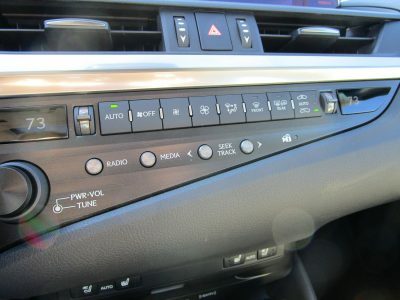 Lexus even manages to fit in an analog clock on the side of the screen. 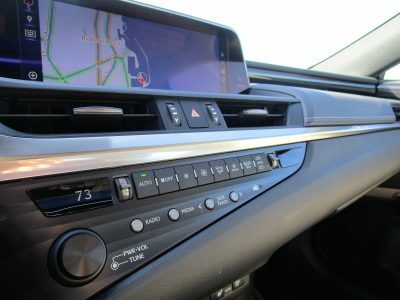 Apple CarPlay integration finally makes it to Lexus in the new ES, so you can hold your head high in the corporate parking lot. 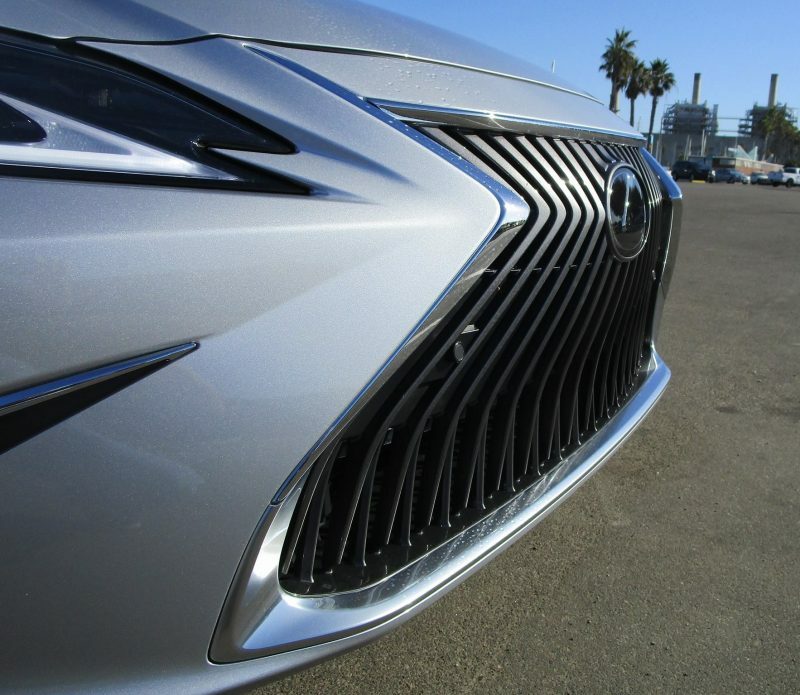 And while you’re bragging, be sure to mention that the ES has the most comprehensive safety system ever offered in a Lexus, from new low-light pedestrian detection and daytime bicyclist detection technology to a built-in camera that helps provide road sign information. 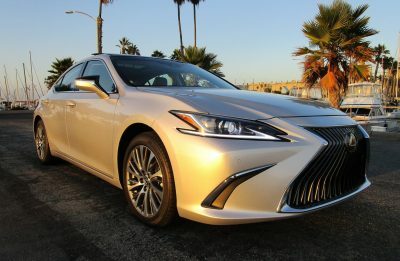 Not only a Lexus best, it’s also best-in-class – no small feat when you consider the upscale European brands play in the same sand box as the ES350. Complaints are few. 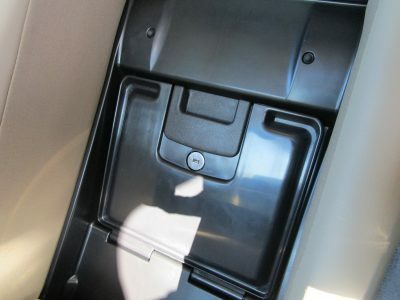 We’re still not big fans of the touch-pad for access to info-tainment. 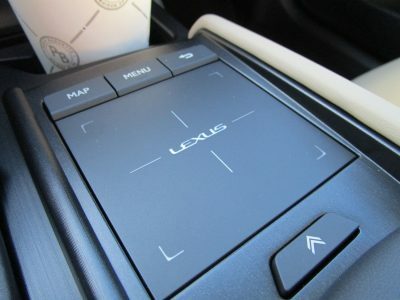 Lexus continues to work and upgrade this ­– it’s probably the best it has been – but it’s still more fidgety than we’d like. 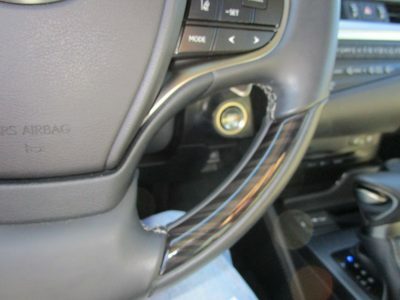 That’s quickly forgotten as your hands grab a steering wheel taken from the über-luxury LS sedan, especially handsome with the optional wood trim. Heated too! 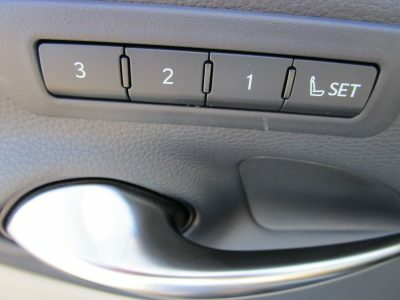 Along with keeping your hands comfy, there’s standard 10-way power front seats that are well suited to those long of leg, and are heated and ventilated for those sweaty of back. 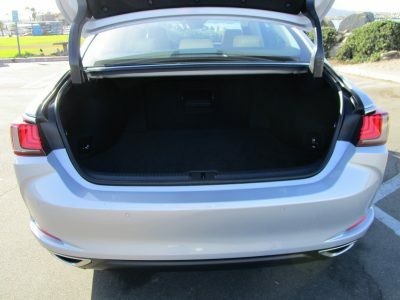 Speaking of back, there’s more rear seat headroom than before, along with class-leading rear legroom, and a larger trunk volume as well. 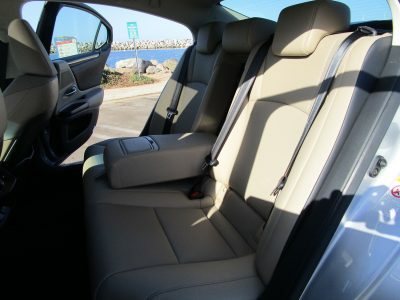 Good looks, high quality and a plush interior are things you’d expect from any Lexus ES. 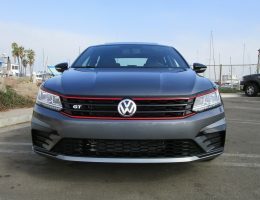 But the new model makes a giant leap in performance and fun-to-drive. 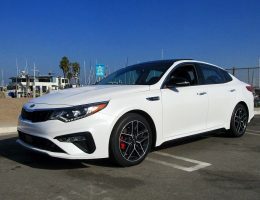 Like the Camry and Avalon that share the underpinnings, motivation is from the heavily-massaged 3.5-liter V6 that kicks out an impressive 302 hp (up 34) and 267 lb-ft of torque (up 19). 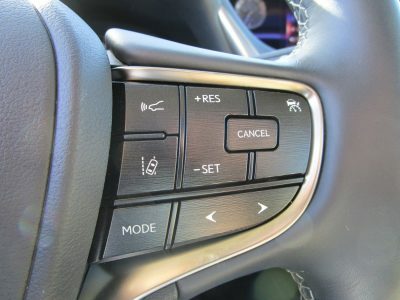 You’re also up two gears, with an all-new 8-speed automatic, and it really helps take advantage of the added power. This is muscle like we’ve never felt in an ES. 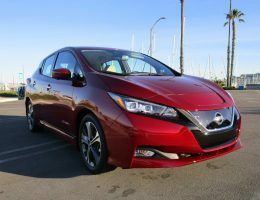 A solid kick in the back, a nice snarl, a quick shift – this baby moves out with authority, and it gets up to big speeds effortlessly. 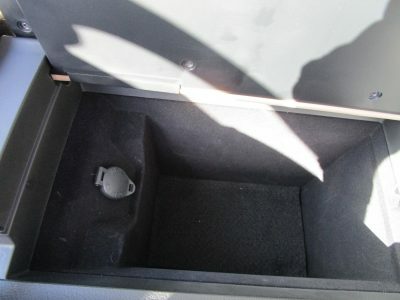 Effortlessly is reinforced with how quiet the cabin is. 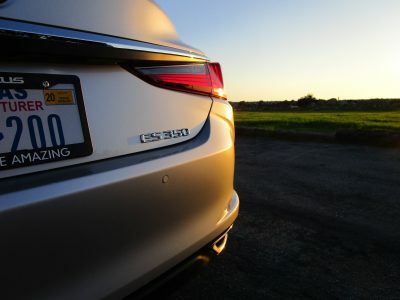 With the new chassis and serious effort to add strength and reduce weight, the ES feels solid as a house. Calm and composed, it brims with confidence. 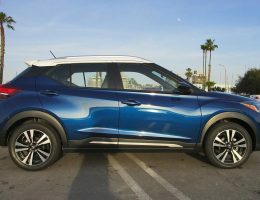 With nicely-weighted steering, our non F-Sport model is a confident handler, and happily eats up on-ramps and off-ramps, while maintaining its genteel demeanor. 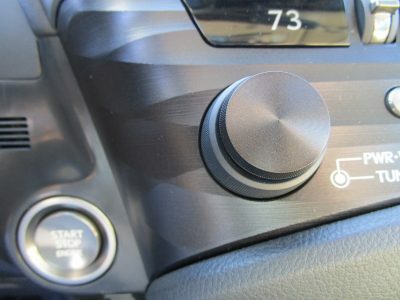 The F Sport receives notable additional attention to making enthusiasts smile, including an Adaptive Variable Suspension, Sport+ Drive Mode, and new Engine Sound Enhancement. 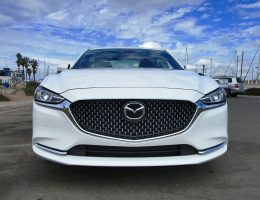 It sounds like our kind of sport sedan, and we can’t wait to get our hands on one. 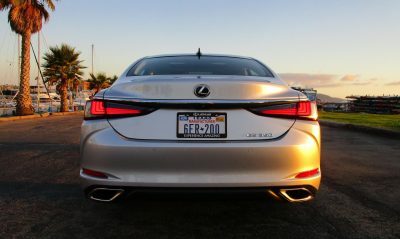 We should also mention at the other end of the spectrum, there’s also the new ES300h Hybrid, featuring a 2.5-liter, 4-cylinder. 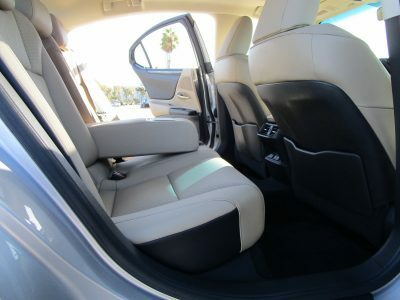 With preliminary estimates of 44 mpg combined, it could be the long-legged cruiser you’re looking for. 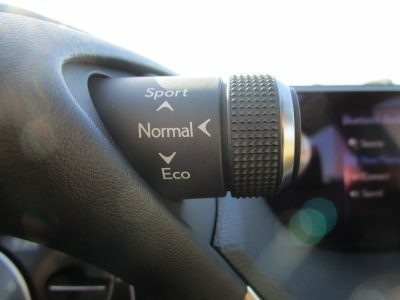 Well, the 2019 ES350 starts at a very competitive $39,500. 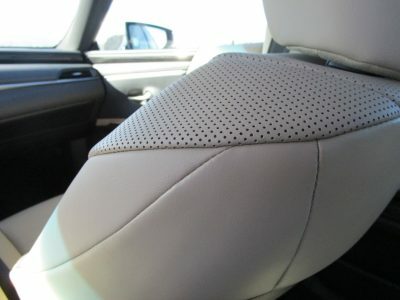 If you fancy perforated leather, wood accents and ambient lighting, the Luxury model comes in at $42,155. 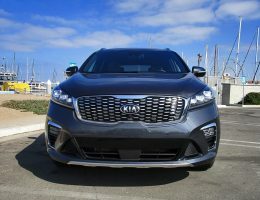 The appropriately named Ultra Luxury lures with its semi-aniline leather, 14-way power adjustable front seats and power rear sunshade, for a small uptick to $43,150. 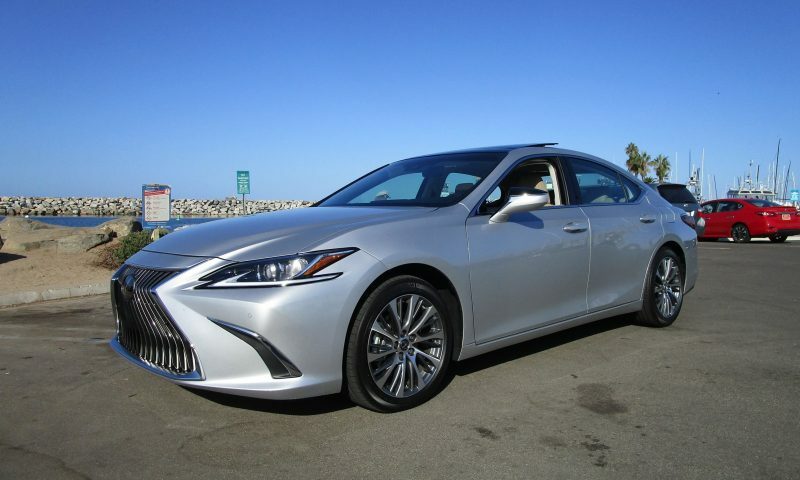 Those lured by tiny fuel bills will find the ES 300h hybrid starting at $41,310. 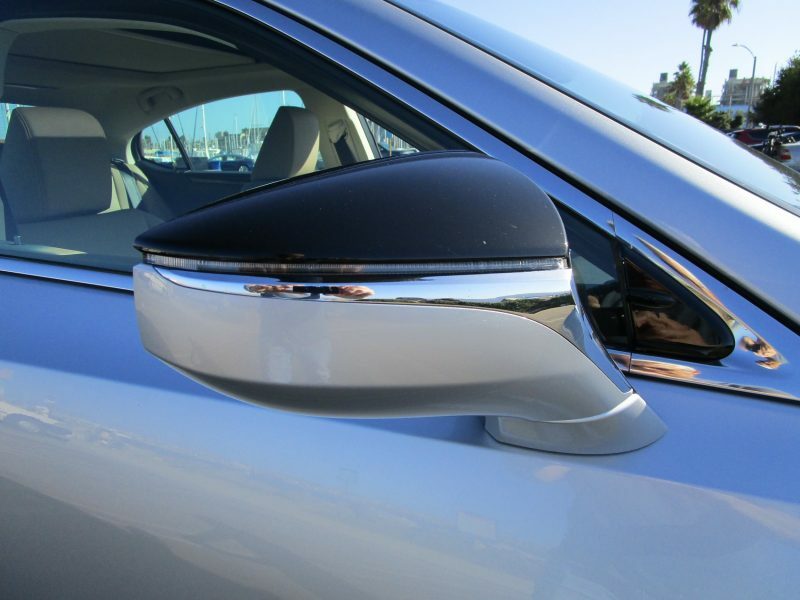 Luxury and Ultra Luxury trims are also available on hybrid. 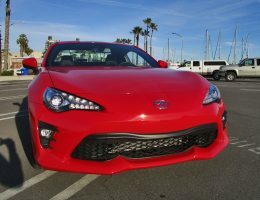 The one that piques our interest is the 350 F Sport with the upgraded suspension, exclusive bolstered sport seats and 19”-rims, which we should point out, are the largest ever on an ES. Yours for a reasonable $44,035. 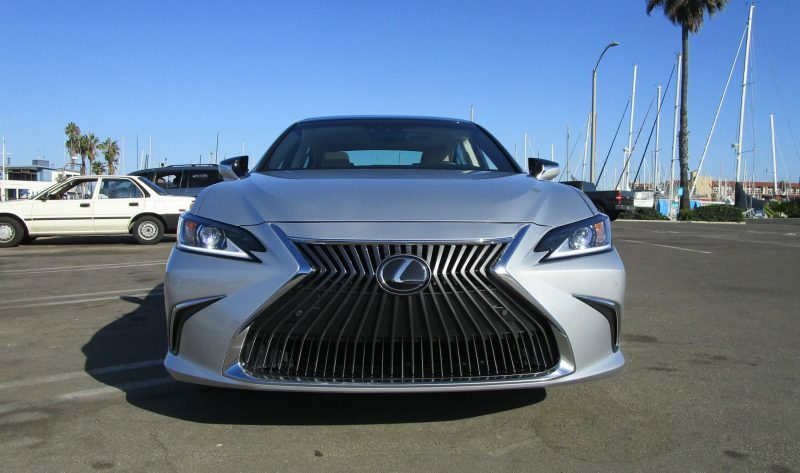 Our tester was a pre-production ES350 prototype, so we can guess that it had the Premium Package ($1,175), Blind Spot Monitor with Rear Cross Traffic Alert ($1,065), 18-inch, Split 10-spoke machined finished wheels ($770), Power trunk with kick sensor ($550), Panorama Glass Roof ($ 500), Wood Trim ($360), Wood and Leather Steering Wheel ($300), and Delivery, handling fee ($1,025). 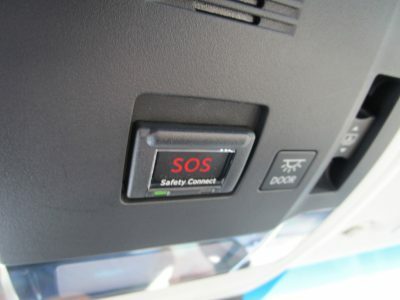 All together, we estimate our ES350 would carry a sticker of $45,245. Competition? 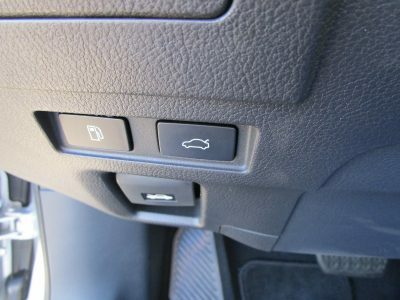 The Acura TLX Advance starts at $43,950. 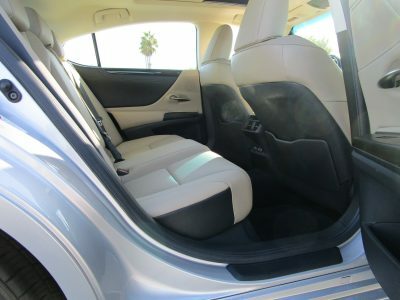 An Infiniti Q50 3.0T Sport starts at $47,950. 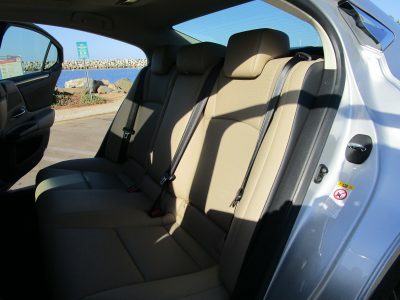 Looking at the Europeans, an E-Class starts at $52,950, and Audi A6 $58,900 and a BMW 5-er $53,400. 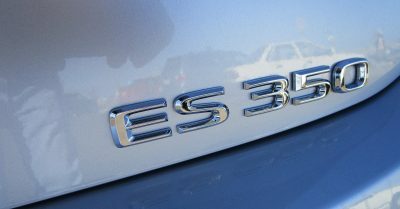 Looks like the ES350 is a solid competitor to other Asian makes, and a bit of bargain against the Europeans. 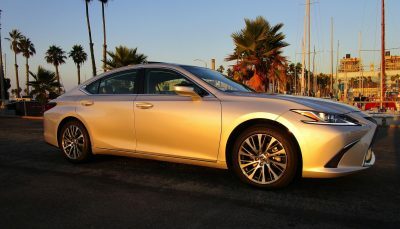 The new Lexus ES350 it gives you everything you expect in terms of living the good life, Lexus style. 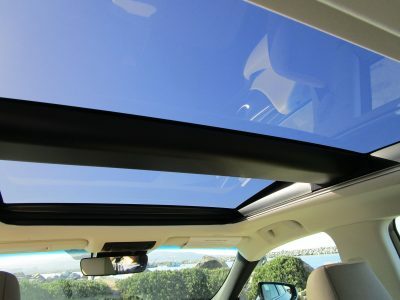 And with its new-found performance, advanced tech, and elegant style, it’s even more desirable in every way. 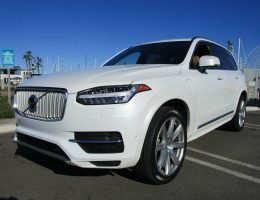 Ben Lewis grew up in Chicago, and after spending his formative years driving sideways in the winter – often intentionally – moved to sunny Southern California. 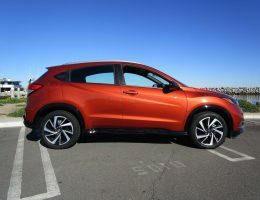 He now enjoys sunny weather year-round — whether it is autocross driving, aerobatics, and learning to surf.